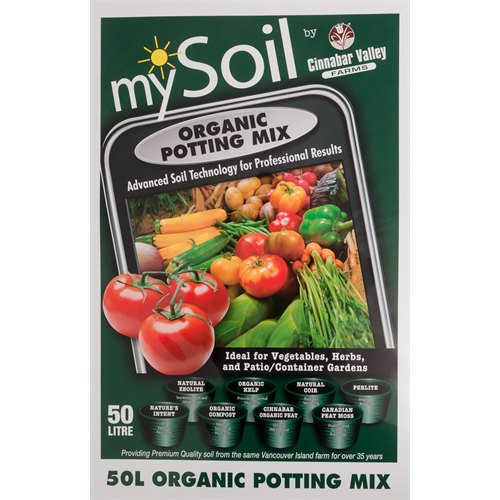 mySoil Organic Potting Mix 50L 55/plt | Cinnabar Valley Farms Ltd.
mySoilOrganic Potting Mix is made from the highest quality "All Natural" ingredients available to produce a professional quality soil for your organic growing needs. 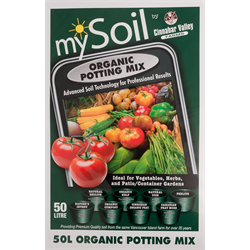 MySoil Organic Potting Mix starts with horticultural grade peat moss. We then add pure coconut coir, premium aged organic compost, and Cinnabars' own organic soil to complete the soil media. To obtain ideal levels of nutrients, drainage, aeration and moisture retention we then add Natural Zeolite, Organic Kelp, premium organic fertilizer and perlite.